Greensleeves offers something different for the day you never want to forget. Our Medieval Feast Weddings are the most ceremonial of all. The Bride and Groom are enthroned and crowned as King and Queen of the Feast. You toast each other from a Medieval, two handled Loving-Cup (our present to you!). Eat as much as you like from a four course feast and cut the cake with a real medieval sword. And of course, leave it up to the Baron and his Minstrels to entertain your guests and afterwards, enjoy superb music and dancing facilities. Our Renaissance Weddings are more contemporary for those who love the atmosphere and want something a little more customary. With a choice of venues, indoors and out, and a selection of splendid food options. Whether you want a large formal wedding or a small intimate one, we will be happy to plan it with you. We have a thatched chapel, beautiful gardens and a choice of reception areas to suite you. Call 083 229 5677 to make an appointment and come have a coffee, chat to us and view the venue. Better yet, join a Medieval Feast to experience what Greensleeves is all about! 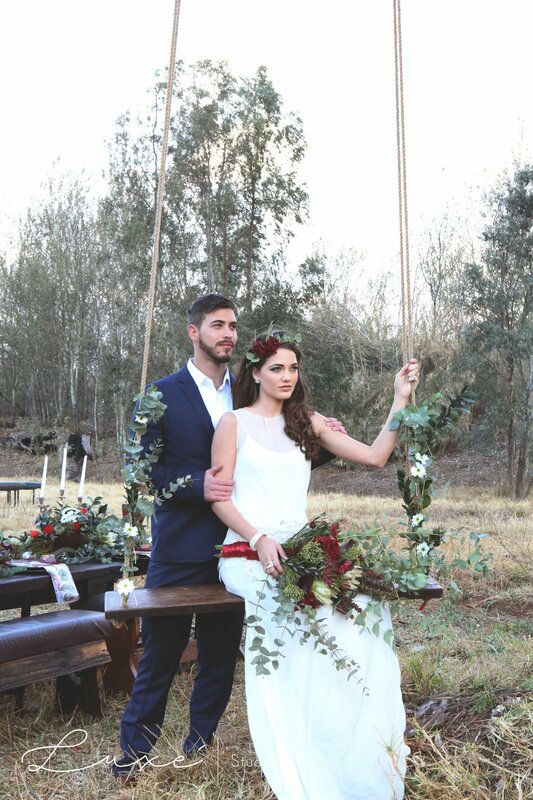 Call 083 229 5677 to book this exquisite Medieval setting for your special day. Whether you want a large formal wedding or a small intimate one, we will be happy to plan it with you. Prices below are listed as: Saturday Nights / Other Nights. Includes The full Medieval Feast with Four Course Meal & Entertainment from the Baron and Troubadours. Excludes Drinks, 10% Staff Gratuity, Cake & Costume Hire. Includes Wedding co-ordinator, Private Reception Hall, Chapel, Bridal Suite, dancing music and microphone for speeches, fully co-ordinated throwing of the bouquet and garter, cake cutting with a real sword, and the Loving Cup ceremony. Loving cup gift. Excludes Minister, Photographer, Flowers, Rose Petals & extra Decor. We can accommodate up to 150 Guests in each of our two Reception Halls. If you do not have the minimum required number of guests, do not worry! You could join a regular Medieval Feast. You can still book the Chapel for your service beforehand, sit at the King's Table and co-ordinate with us on a schedule for cake-cutting and other private activities. The full Medieval Feast. Includes Four Course Meal & Entertainment from the Baron and Troubadours. Excludes Drinks, 10% Staff Gratuity, Cake & Costume Hire. None, you would join a public Medieval Feast. The Chapel, Kings Table & Bridal Suite can be booked separately and is not included. Kings table (seats 26) - Chapel hire - Bridal Suite from 12:00 on the day with a champagne breakfast basket for the following morning. * Prices are valid for 2017 and subject to change. Discount possible depending on when your wedding is held. Greensleeves has a beautiful thatch-roofed, red-carpeted chapel, which seats 160. It is fully equipped with a sound system. If you don't have a minister we can arrange one for you. You might also want to bring a flower arrangement for the chapel, as it always adds to the beauty of the occasion. We have special Bridal Party Costumes and 500+ Costumes for your Guests to choose from. We are confident that we will find a costume to fit everyone. Wearing Costumes are completely optional and not included in the per person price. Costume Hire usually opens 45 minutes to an hour before the start of the chapel service. Spend the night in the 'Jane Seymour Suite', a plush room with a four poster bed, luxury bathroom with walk in shower and Victorian bath. You will have use of the Suite from 12.00PM on the day until the following morning. Includes a picnic breakfast and bottle of sparkling wine. Every aspect from music to photography to flowers can be handled for you. We have many great money-saving ideas. The décor at Greensleeves is impressive, which makes draping or additional flower arrangements entirely optional. Call Lauren on 082 602 2958 to find out more, or organize to come and have a coffee on a Saturday morning and view our highly photogenic & unique venue.